The hardest truth to swallow is that the world isn’t really fair, and it isn’t a world you’d necessarily draw up from scratch. It’s not usually what you suppose it should be. None of what’s around us came about by grand design: From a spark many billion years ago, things evolved in a fairly undirected manner (as far as we can tell). When the world doesn’t quite agree with our ideas, we often begin distorting our own cognition. We confuse should with is, and then complain or rationalize when reality shows we’ve gotten the wrong answer. The problem is that reality is way more complex than a simple fairness test would hope to show. A really large-scale egalitarian society has never worked for a few interrelated reasons, chief among them that: groups don’t have power, people have power (raising the question, who specifically decides how to allocate society’s resources? ); utopia doesn’t scale; market forces provide very effective carrots, sticks, and signals that directed egalitarianism lacks, among other reasons. Reaching for extreme levelness in outcomes has always been deeply problematic and always will be, because that’s how reality is constructed. Inevitably when certain people who get into power run the experiment again, and it does not work as intended, its deepest acolytes return to first principles instead of acknowledging a flawed premise. Well, that wasn’t real Marxism. Yes the proposed system of economic distribution didn’t work, but that’s not our fault. It still should be this way. Things should be fairer. We just did it wrong. Let’s run it again! Results like that show the brain performing some real acrobatics to keep its desired and cherished idea intact. The Greek statesman Demosthenes, living about 350 years before the birth of Christ, put it best by saying “What a man wishes, he also believes.” In other words, because we want it to be true, we make it so in our minds, evidence be damned. We’re all subject to this bias from time to time. In the financial world, many an investor has seen his investment go south only to complain about how unfair the damn world is, how things shouldn’t have gone that way — the CEO should have been more attentive, the creditors should have been more fair, competitors should have been more rational. It’s not supposed to go like this! Far from the investor’s mind is the thought that he simply misdiagnosed a complex situation with a range of outcomes, including bad ones. But reality is irreducibly complicated — it doesn’t ignore things just because you do. It isn’t supposed to be anything. It’s just hard. This isn’t to be harsh. It’s just the way things are. It’s not about you. Nature just doesn’t care too much about your should. This happens in relationships all the time. It’s almost an iron rule of life that marrying someone with the intent of changing them is not going to work. Who wants to be chiseled, molded, and nagged by their spouse? Who’s really been successful at that? Most of us seek acceptance, and when we don’t get it, we fight for our independence. That’s just human nature. And yet how many divorces happen due to traits that were plainly present before the marriage began? Is a continuation of long-held traits the fault of the non-compliant spouse, or was there a willful misunderstanding from Day 1? That’s not to say that a good spouse shouldn’t work to improve themselves. Of course they should. It is a recognition of the base rate that major improvements are not very common. And so our lack of understanding human nature and of the complex reality leads us to bad results, frequently because we wish the world was another way. We think it ought to be another way, and we keep that conclusion even after the world shows us we’re wrong, leading to one mistake after another as we rationalize repeated errors with ought style thinking. Start resolving to test yourself with the basic question: Do I believe this because I wish it was so, or because it actually is so? Have I acted in some way because I wish that action caused success, or because it actually does? If you can’t tell the difference, it’s likely to be wishful. And if you simply don’t know, then leave it at that: You don’t know. Resolve to find out the truth as best you can. The Powerful Predictor Behind Successful Relationships — When does a broken relationship start to go wrong? Whatever you’re thinking — an awkward conversation with your boss, the white lie you told about being busy that was discovered, the time you were supposed to be out with friends but were really somewhere else — you’re probably wrong. While this is obvious, it is something that most people to a greater or lesser degree choose to ignore. They ignore it because our route to reality is not easy. First of all, we are not born with maps; we have to make them, and the making requires effort. The more effort we make to appreciate and perceive reality, the larger and more accurate our maps will be. But many do not want to make this effort. Some stop making it by the end of adolescence. Their maps are small and sketchy, their views of the world narrow and misleading. By the end of middle age most people have given up the effort. They feel certain that their maps are complete and their Weltanschauung is correct (indeed, even sacrosanct), and they are no longer interested in new information. It is as if they are tired. Only a relative and fortunate few continue until the moment of death exploring the mystery of reality, ever enlarging and refining and redefining their understanding of the world and what is true. But the biggest problem of map-making is not that we have to start from scratch, but that if our maps are to be accurate we have to continually revise them. The world itself is constantly changing. Glaciers come, glaciers go. Cultures come, cultures go. There is too little technology, there is too much technology. Even more dramatically, the vantage point from which we view the world is constantly and quite rapidly changing. When we are children we are dependent, powerless. As adults we may be powerful. Yet in illness or an infirm old age we may become powerless and dependent again. When we have children to care for, the world looks different from when we have none; when we are raising infants, the world seems different from when we are raising adolescents. When we are poor, the world looks different from when we are rich. We are daily bombarded with new information as to the nature of reality. If we are to incorporate this information, we must continually revise our maps, and sometimes when enough new information has accumulated, we must make very major revisions. The process of making revisions, particularly major revisions, is painful, sometimes excruciatingly painful. And herein lies the major source of many of the ills of mankind. What happens when one has striven long and hard to develop a working view of the world, a seemingly useful, workable map, and then is confronted with new information suggesting that that view is wrong and the map needs to be largely redrawn? The painful effort required seems frightening, almost overwhelming. What we do more often than not, and usually unconsciously, is to ignore the new information. Often this act of ignoring is much more than passive. We may denounce the new information as false, dangerous, heretical, the work of the devil. We may actually crusade against it, and even attempt to manipulate the world so as to make it conform to our view of reality. Rather than try to change the map, an individual may try to destroy the new reality. Sadly, such a person may expend much more energy ultimately in defending an outmoded view of the world than would have been required to revise and correct it in the first place. This beautiful excerpt encapsulates so much of Farnam Street. The Map is Not the Territory — Maps are necessary, but flawed. The problem, however, goes deeper than abstraction. What made Charles Darwin an Effective Thinker? — Most people take evidence that disconfirms their prior beliefs and ignore it. Darwin was different and that’s part of the reason he was so incredibly successful. Joseph Tussman: Getting the World to do the Work for You — The world will do the work for you if you know this one secret. 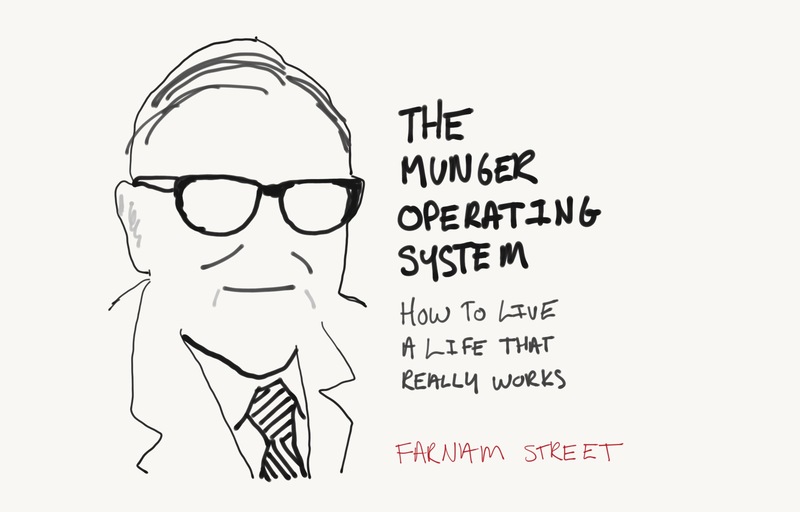 The Farnam Street Latticework of Mental Models — Acquiring knowledge may seem like a daunting task. There is so much to know and time is precious. Luckily, we don’t have to master everything. Exploiting Unrecognized Simplicity — How geniuses really prosper. Once you know this, the world looks different.